The integration of renewable energies into the existing power grids in Europe is already a huge challenge today. The German transmission system operator Tennet alone, for example, reported a sharp increase in grid stabilizing measures, the costs for it increased in 2017 compared to 2016 by about half to almost one billion euros (1). At least a significant part of it is issued by renewable energy. These problems will increase to a considerable extent if it is truly intended to implement international climate change commitments. To achieve the goals of the Paris Climate Agreement, depending on the model, our energy supply will have to operate entirely or almost entirely without fossil fuels between 2040-2050. This not only affects the power supply, but also the heat and the mobility sectors. An exponential increase in demand for electricity as a basis for heat and electricity also requires a massive expansion of renewable energies, in particular photovoltaics and wind power. Even the smartest grid will not handle this challenge. According to calculations by Professor Volker Quaschning of the University of Engineering and Economics HTW Berlin, the demand for energy storage capacity will increase by a factor of 1000 until the end of the energy transition in 2040 (2). For the same reason the annual Energy Infrastructure Forum of the European Commission concluded end of May 2018 in Copenhagen that electrification especially requires high seasonal storage. There are several models already tackling this task. In principle, you can distinguish 2 major types of storage, namely the decentralized demand side storage and the big scale storage on the generation side, which mainly will have to deal with big scale excesses. The decentralized demand side storage is basically based on the idea of fast responding, short term exchange of available resources. Essentially, domestic batteries and electro vehicles have emerged as practicable options. Considerable alternatives also include heating and cooling systems as well as various industrial processes and backup systems that can absorb or release energy at short notice. With regard to this decentralized demand side storage, various control models have been developed. A key one is the aggregator, which manages the resources of the active demand (Read our blog: “The aggregator within the flexibility principle”). This already leads to a higher flexibility, what for its part ensures significant increase of integration of renewable resources. In the end, however, this is just a drop in the bucket, against the backdrop of immense volumes that need to be managed. There are currently 3 serious variants of large voluminous storage options. First, there is already a stock of water pump power plants in Europe, which with an efficiency of approx. 80% is in principle ideal for a seasonal storage of large amounts of energy. The main problem with this technology is that expansion capacities are limited. Constructing pumped power plants represent a significant environmental impact that can no longer or only with great difficulty be approved in a realistic manner. Further, there is the model of big scale battery storage, that creates a long-term intermediate storage facility. As the first serious try, regarding industry news, the UK grid operator National Grid plans to install a battery network of 45 fifty-megawatt battery storage units at critical points in England, Scotland and Wales, all in all with a capacity of more than two gigawatts. Battery systems are able to be added to the existing system easily and with an initially efficiency of 80-90 % attractive as a storage system. This advantage turns into a disadvantage if it would be used for a longer-term storage as the losses are high. Another problem is that lithium and cobalt are considered key elements of battery technology. Their global reserves are limited and are located, in part, in politically unstable regions of the world. Experts warning that the global increase in demand for both metals could soon lead to a shortage and thus to a cost explosion on the raw materials market. Scientists at the Karlsruhe Institute of Technology and the Helmholtz Institute Ulm have come to the conclusion in a recently published study that while prices will rise, supplies will be secure and new technologies for at least partial replacement of the materials appear possible. In summary, distributed electricity storage is an interplay of decentralized, highly flexible resources and large-scaled short and long-term storage media. 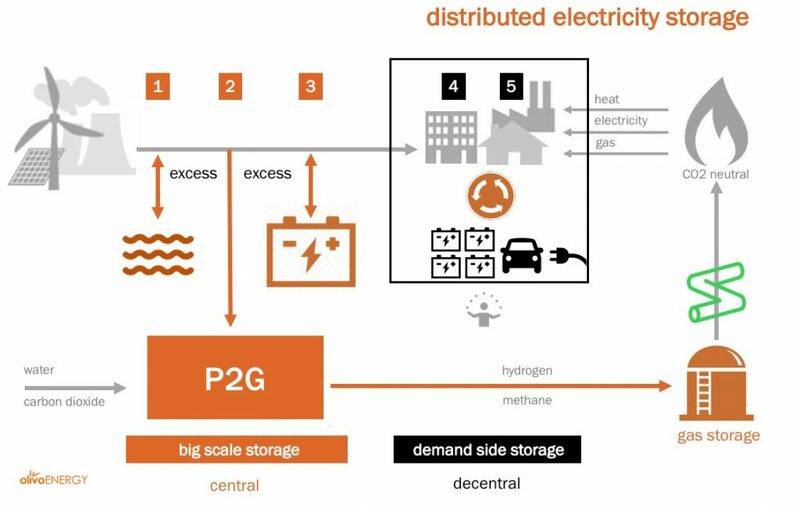 An integrated storage concept is a key component of a feasible energy transition and, essential, the integration of the gas grid is indispensable in order to cope with an incredible increase in the demand for energy storage, caused by the electrification of all relevant sectors, powered by renewables.